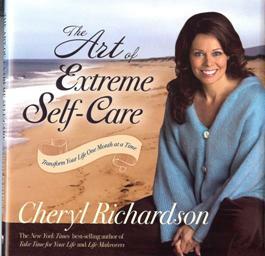 Cheryl offers this book from the depths of her life. Both from her work with the founder of coaching, Thomas J. Leonard, as well as having to wrestle with the overwhelm of caregiving in her own life. She introduces Thomas's concept of "extreme self-care" to the broad public for purposes of healing and grounding people who are themselves trapped in their cycle of unending caring and giving. Giving to others to the point of utter exhaustion is ultimately destructive for you and those your care for. In 12 chapters you have exercises, activities, challenges and questions all designed to help you lift up a mirror to your own life and get a true picture of your life and how you are managing it. The idea is that you can only give your best if you are, at the core, caring for yourself the best. If you want to see that your family is well cared for, then your own health, your own environment, your own passions and interests, your own dreams all matter.